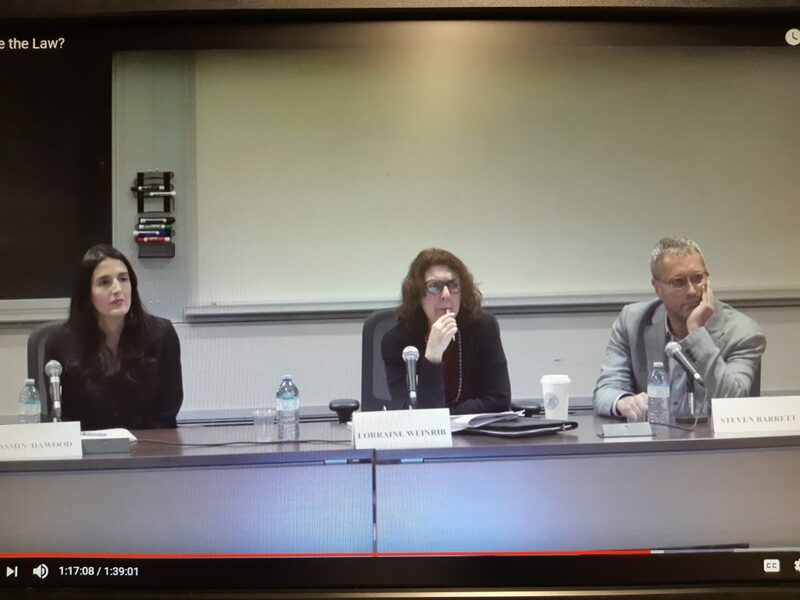 On September 20, 2018 the David Asper Centre for Constitutional Rights convened a panel with U of T Law Professors Yasmin Dawood and Lorraine Weinrib, and Goldblatt Partners’ Steven Barrett to discuss the constitutional challenge to the Better Local Government Act. The proposed legislation would have reduced the size of Toronto’s city council in the midst of its municipal election, as well as ending mandatory election of regional councillors across all regional municipalities. Superior Court Justice Edward Belobaba struck down the legislation, finding that it was an unjustified infringement to s.2(b) of the Charter. The Court of Appeal of Ontario ultimately granted a stay of the Superior Court’s decision until a full appeal could be heard after the election. Its effect was allowing the Better Local Government Act to govern the 2018 municipal elections in Ontario. Before the Court of Appeal rendered its decision, Ontario’s Premier Doug Ford had threatened to invoke the notwithstanding clause if a stay was not granted. The notwithstanding clause allows the federal government or a provincial government to enact legislation that overrides certain fundamental freedoms, legal rights, and equality rights guaranteed in the Charter. Premier Ford further warned that he would not hesitate to use the notwithstanding clause in the future, without providing specific details. The panelists all provided unique perspectives regarding the constitutional challenge to the Better Local Government Act and the notwithstanding clause itself. Professor Dawood summarized the Superior Court and Court of Appeal decisions. She noted the that it was “novel” to argue that the Better Local Government Act infringed s.2(b) by depriving voters of their right to cast a vote that would enable effective representation. She questioned whether the legislation also infringed the s.2(b) rights of political donors. Professor Dawood ultimately concluded, “Interrupting an election midstream is inappropriate and completely inconsistent with notions of democratic and electoral fairness, even if it is the case that the provincial government has the power to do so.” Democratic legitimacy and electoral fairness requires that the provincial government consult all stakeholders before changing election laws. Professor Weinrib focused on the principles that govern use of the notwithstanding clause. She emphasized that the drafters envisioned the notwithstanding clause as a narrow exception, used only when a Charter right would “fundamentally damage society’s stability and well-being.” She added that the notwithstanding clause cannot be applied retroactively; in this case, the provincial government cannot invoke the clause since candidates already spent resources, social capital, volunteers, and energy; and interacted with their constituents. Professor Weinrib further criticized Premier Ford for threatening to invoke the notwithstanding clause whenever the courts strike down provincial legislation as unconstitutional. She recommended asking the Supreme Court of Canada to clarify the constitutional principles that govern the use of the notwithstanding clause. Mr. Barrett discussed specific Charter arguments made in the case, as well as the Court of Appeal’s decision. He commented that for the stay application, it was “unusual” for the Court of Appeal to examine the substantive merits of the s.2(b) argument rather than the usual factors for a stay application. He criticized the Court of Appeal for ignoring how the Better Local Government Act undermines the effectiveness of candidates’ political speech. Mr. Barrett criticized Premier Ford for threatening to routinely use the notwithstanding clause in the future as well. He warned this threat has a “corrosive effect” on judicial legitimacy and potentially judicial independence. Individuals must make it clear that using the notwithstanding clause is only appropriate in exceptional circumstances. Provincial governments have rarely used the notwithstanding clause, particularly for its intended legal function. From 1982 to 1985, the Parti Québécois placed a notwithstanding clause in all of its new legislation and retroactively amended all existing laws to include such a clause in order to protest the enactment of the Constitution Act, 1982, which it had not signed. Its actions were a political protest, rather than aimed at protecting a specific law from a Charter challenge. In 1988, Quebec’s provincial government invoked the notwithstanding clause in response to the companion cases, Ford v Quebec (AG) and Devine v Quebec (AG), which struck down provincial legislation that prohibited the public use of all languages other than French. The legislation already had a notwithstanding clause to override s.2(b) of the Charter; however, the Supreme Court of Canada held that the legislation unjustifiably infringed a similar guarantee in Quebec’s Charter of Rights and Freedoms. The provincial government then introduced a virtually identical bill, except with clauses to override the Charter and the Quebec Charter for a five-year period. Following the expiration of this period, the provincial government amended the law. The amended law did not include a notwithstanding clause. In 2017, Saskatchewan’s provincial government used the notwithstanding clause in the School Choice Protection Act. Its use responded to Good Spirit School Division No. 204 v Christ the Teacher Roman Catholic Separate School Division No. 212, which held that funding non-Catholic students who attended Catholic schools was an unjustified infringement of s.2(a) and s.15(1) of the Charter. Saskatchewan Premier Brad Wall justified its use on the basis that the legislation would protect school choice for parents and students, including faith-based options. There was no political opposition to its use. Most recently, Québec Premier François Legault threatened to use the notwithstanding clause in order to pass a controversial “secularism law.” This proposed legislation would prevent public servants – including teachers, police officers, and judges – from wearing religious garments while performing public functions. The law is widely interpreted as targeting Muslim women who wear a niqab. It is hoped that Ford and Legault’s recent threats will not embolden others to invoke the notwithstanding clause inappropriately. In light of these threats, the appropriate use of the Constitution’s notwithstanding clause must continue to be scrutinized, perhaps as Professor Weinrib suggested by the Supreme Court of Canada itself.